"When he established the clouds above: when he strengthened the fountains of the deep"
One hundred and fifty years ago, in Journey to the Centre of the Earth, French science-fiction forerunner Jules Verne pictured a vast sea that lay deep under our planet's surface. Today, that strange and haunting image has found an unexpected echo in a scientific paper. That particular zone in the Earth, the transition zone, might have as much water as all the world's oceans put together. Writing in the journal Nature, scientists said they had found an elusive mineral pointing to the existence of a vast reservoir deep in Earth's mantle, 400 to 600 kilometres beneath our feet. It may hold as much water as all the planet's oceans combined, they believe. The evidence comes from a water-loving mineral called ringwoodite that came from the so-called transition zone sandwiched between the upper and lower layers of Earth's mantle, they said. Analysis shows a whopping 1.5 per cent of the rock comprises molecules of water. "This sample really provides extremely strong confirmation that there are local wet spots deep in the Earth in this area," said Graham Pearson of Canada's University of Alberta, who led the research. "That particular zone in the Earth, the transition zone, might have as much water as all the world's oceans put together." Ringwoodite is named after Australian geologist Ted Ringwood, who theorised that a special mineral was bound to be created in the transition zone because of the ultra-high pressures and temperatures there. A piece of this mineral has been a long-sought goal. It would resolve a long-running debate about whether the poorly-understood transition zone is bone-dry or water-rich. But until now, ringwoodite has only ever been found in meteorites. Geologists had simply been unable to delve deep enough to find any sample on Earth. Good fortune, though, changed all this. 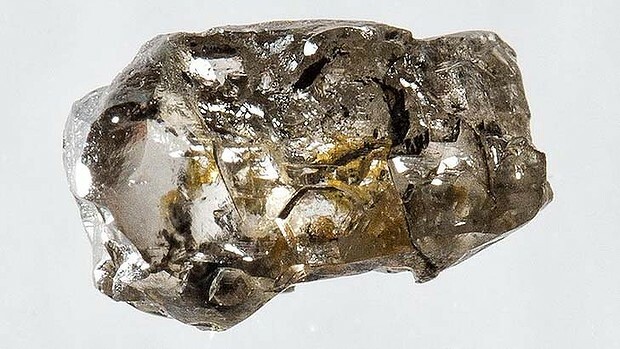 In 2008, amateur gem-hunters digging in shallow river gravel in the Juina area of Mato Grasso, Brazil, came across a tiny, grubby stone called a brown diamond. Measuring just three millimetres across and commercially worthless, the stone was acquired by the scientists when they were on a quest for other minerals. But the accidental acquisition turned out to be a bonanza. In its interior, they found a microscopic trace of ringwoodite – the very first terrestrial evidence of the ultra-rare rock. "It's so small, this inclusion, it's extremely difficult to find, never mind work on," Pearson said, paying tribute to the diligent work of grad student John McNeill. "It was a bit of a piece of luck, this discovery, as are many scientific discoveries." The team theorise the brown diamond rocketed to the surface during a volcanic eruption, hitchhiking in a stream of kimberlite, the deepest of all volcanic rocks. Years of analysis, using spectroscopy and X-ray diffraction, were needed in specialised labs to confirm the find officially as ringwoodite. Scientists have debated for decades about whether the transition zone has water, and if so, how much there might be. None, though, has embraced Verne's fancy of a subterranean sea with a rocky coastline dotted with forests of giant mushrooms and petrified trees. He also said the water was likely to be locked up in specific rocks, in a molecular form called hydroxyl. "In some ways it is an ocean in Earth's interior, as visualised by Jules Verne ... although not in the form of liquid water," Keppler said in a commentary also published by Nature. The implications of the discovery are profound, Pearson suggested. If water exists in huge volumes beneath Earth's crust, it is bound to have a big impact on the mechanics of volcanoes and the movement of tectonic plates.